Posted by StrategicGrowth in demographics, local marketing strategies, mobile, mobile coupons, Mobile Marketing. The assumption that marketers make who are still unfamiliar with Mobile Marketing and its benefits, is that it only works on consumers who have high-end smartphones. In my discussions with small business owners who are considering the use of mobile as a part of their marketing strategy, there is a strong belief that Mobile Marketing can’t be effective because, though growing rapidly, the smartphone consumer segment is still in the minority as compared to feature phones. Therefore, they believe that a majority of consumers will not be able to see their ads. However, much to the contrary, any number of studies conducted in the last couple of years indicate clearly that Mobile Marketing is a highly effective medium at reaching all consumers, not just smartphone owners. And not only is mobile effective with consumers, it is also in-demand from them. The most effective method of mobile marketing is SMS (text) messaging, due to its ability to cross all mobile operating systems; it has no dependence on being able to access a smartphone. The study detailed below, conducted by Harris Interactive, clearly indicates that consumers of both smartphones AND feature phones are quite open to receiving SMS messages and that location-based messaging is increasing their effectiveness. Though smartphone shipments are rising and expected to surpass shipments of feature phones in 2011, according to Morgan Stanley, feature phones are still the devices in the hands of most mobile users. An April 2010 ExactTarget study found 58% of all US internet users ages 15 and older had one, compared with 31% who had a smartphone. That means a large swathe of mobile users cannot be reached by more sophisticated mobile marketing efforts like sponsored apps, in-app ads or campaigns on the mobile web. According to location-based advertising network 1020 Placecast, opt-in text alerts are the smart way to target a fuller mobile audience. A May 2010 survey conducted for Placecast by Harris Interactive found that while most mobile users still have not signed up for any text alerts, there was a small rise in interest since a similar poll in 2009: 28% were at least somewhat interested in the alerts, up 2 percentage points, and 8% were extremely or very interested, up 3 percentage points. For under-35s, interest was significantly higher. 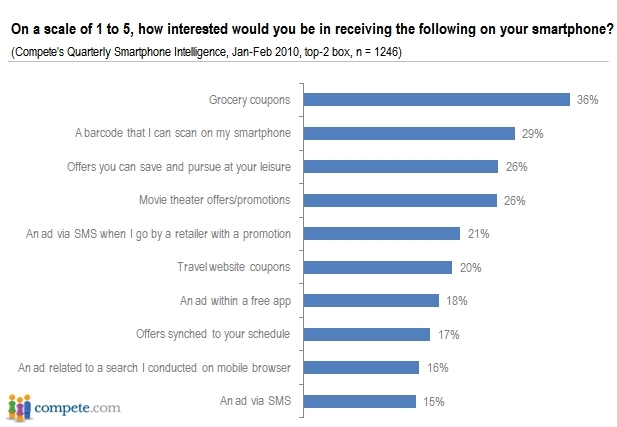 Those who wanted the alerts were most interested in coupons and promotions from grocery stores and restaurants. Respondents who had signed up for text alerts said it made them more likely to visit the company’s website (34%), visit the store (33%) and purchase the product being promoted, either in online (28%) or in the store (27%). Many agreed that making those text alerts location-based, so that recipients would get the right offer at the right time, could make the channel more useful or interesting.While awareness of location-based text alerts is still building, there is the potential to reach a broader audience than with check-in apps such as foursquare or Gowalla, which are designed with smartphone owners in mind. And despite negative attitudes of many mobile users toward SMS marketing, Placecast reports low opt-out rates among recipients.“The brand faithful view these kinds of alerts as a service, not just marketing or an intrusion,” Placecast CEO Alistair Goodman told eMarketer. Posted by StrategicGrowth in local marketing strategies, marketing strategies, mobile, mobile coupons, Mobile Marketing, Strategic Growth Concepts. In Part III of our series we reviewed a wide range of Mobile Marketing case studies that showcase the ways in which Mobile Marketing is being utilized by both large and small businesses. Now, in Part IV of our series on Mobile Marketing, we’re going to look more specifically at the ways to effectively utilize it to promote your firm within a specific local marketing area. As you know from reading the earlier segments of our series, mobile phone advertising is quickly becoming a key component in large business marketing campaigns – large companies are definitely the early adopters of the technology. And since billions of people use cell phones every day, and over 12 billion text messages are sent every month in the US, the reasons for big business adoption of the technology are clear. However, Mobile Marketing can be even MORE effective for small local businesses once they understand how to use it effectively. One of the reasons many small business owners give me for not using Mobile Marketing, is their belief that they will be sending messages to lots of people outside their market area who will never have need for their product or service, and because so many people are thought to be receiving their messages, they assume it will be extremely expensive. However, THEY COULDN’T BE MORE WRONG! A primary advantage to using Mobile Marketing is its ability to very specifically target your messages to only those you want to receive them according to very specific demographic criteria. Remember, Mobile Marketing is an ‘opt-in’ medium. Once someone has opted in to your list, you can segment them according to whatever criteria is most effective to you in marketing your business. The more information you gather about them, the more information you can use to target them specifically. Let’s say you run a small ice cream shop or a family-owned restaurant and your customer database includes information on the names, ages and birthdates of your customer’s kids. 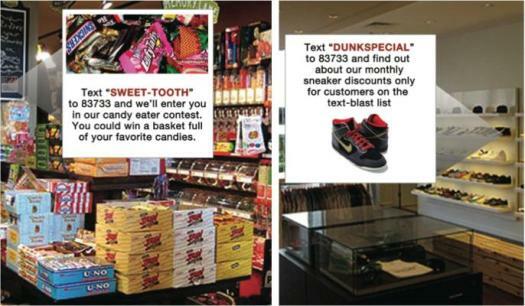 How about sending coupons for a free cone or a free kid’s dinner on each of your customer’s kid’s birthdays via SMS messaging? Or if you run a beauty salon, or work for a doctor’s office, how about sending text message reminders about upcoming appointments in order to cut down on your ‘no shows’? 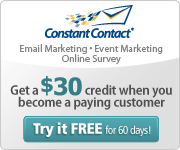 This form of personal contact is perfect for any type of service business. If you run a massage parlor or day spa, consider sending discounts or coupons to your customers on their anniversaries, birthdays or other special occasions. If you run a woman’s clothing store, you can suggest that your customers fill out a card asking to be notified when particular new items in their preferred style, size, brand arrive in inventory; then you can text them when those items arrive. Or you can send an offer for an inventory close-out sale for current customers only when you’re getting ready to change seasonal inventory. If you’re a toy store at Christmas and you manage to get a shipment of the ‘must have toy of the season’ that everyone is clamoring for and can’t find anywhere, don’t you think a text message to your existing customers will result in their IMMEDIATE presence in your store when you send a text telling them you have the item in stock but supplies are limited and likely to be gone by tomorrow? AND, don’t you think they’ll be extremely grateful for the information and likely to think of your store first the next time they need a hard-to-find toy item? The possibilities are really endless when you think about ways to increase your contact with customers via Mobile technology. Mobile Marketing allows you to provide a much higher level of customer service to your clients, as well as developing creative, cost-effective ways to obtain new clients. View Local Mobile Marketing examples in our Flickr stream. Mobile phone advertising can also become an extremely inexpensive form of viral marketing if you indicate in your text message that the offer is good for any friend or family member that your customer forwards the text message to. A modern version of “I told two friends…and they told two friends…,” the possibilities for your business are seemingly limitless. Whether you run a storefront or a service business, viral mobile phone advertising is a great way to fill in slow periods throughout the week your company may be having. Suppose you run a cleaning service and your Wednesdays are typically slow; consider sending a text message to your database of customers who may not have used your services for awhile, offering a discount on a whole house cleaning to anyone who responds within the next 3 hours – or to make it competitive, indicate that the first person to respond will receive 1 month worth of whole house cleaning services. This will get those who haven’t thought of your business in a while thinking about it again – even if they don’t win the contest, and the next time they need cleaning service, they’ll likely call you. Try to make your offers fun and appealing so your customers will pass them on to friends and family; this will help to build your ‘opt-in’ list so more people will receive future messages from you. A small bit of creativity together with a commitment to offering a personal touch through Mobile Marketing will really set you above your competition in your customer’s minds. If you would like to learn how Mobile Marketing can be used effectively with strategies for your specific business, please contact Strategic Growth Concepts via our website or email us directly at info@StrategicGrowthConcepts.com . Our strong relationships with a wide variety of mobile services providers insures that we will be able to find the right solution for your business, and work with you to develop an exciting Mobile Marketing campaign that will generate interest in your business and revenue for your company. The author, Linda Daichendt, is Founder, CEO and Managing Consultant at Strategic Growth Concepts, a consulting firm specializing in start-up, small and mid-sized businesses. Linda is a recognized small business marketing expert with 20+ years experience in a variety of industries including: wireless, retail, chemical distribution, residential and commercial contracting, automotive aftermarket, personal services, shopping center development/management, and entertainment facilities management. Linda is available for consultation and can be contacted at linda@strategicgrowthconcepts.com. The company website can be viewed at http://www.strategicgrowthconcepts.com.